I like to have the TV on when I work from home because it makes me feel like I’m not alone. Weird, much? 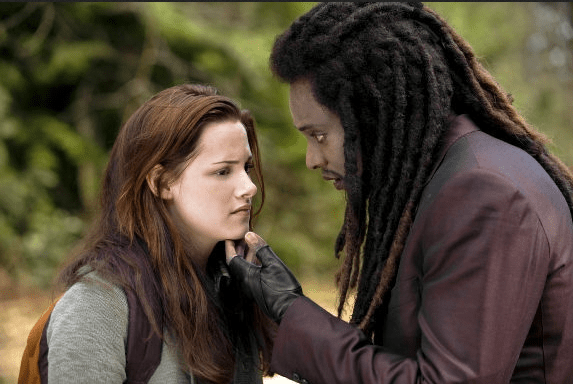 Usually I watch HGTV or DIY, but the other day – for kicks and giggles – I was watching the second Twilight movie. Eclipse, I think? The one where the vampires leave town and Bella is angsty. I’ve seen all of the movies once before, and, while they’re bad – quite bad – I won’t say they aren’t entertaining. But I was always struck by some unknown element that made them…wrong…bad. Is it bad acting? Bad directing? Bad writing? Bad directing PLUS bad acting? This time though I think I finally figured it out. Humor me for a minute. Some of the director’s choices are not ideal. For example, when the camera lingers on a character, who, presumably, is supposed to be conveying some dramatic feeling but that feeling gets lost because the actor isn’t portraying that dramatic feeling. I’m left to question what’s driving the emotion. In multiple scenes Bella is screaming like she’s in labor and writhing on the bed so I assume she’s in pain – from what I don’t know – but in actuality she’s having a nightmare. Have you seen someone having a nightmare? That’s not what nightmares look like. Night terrors do involve copious amounts of bloody murder screaming, but not the pushing-a-baby-out-your-body kind of screaming. In another scene Bella starts clutching her stomach, groaning, and falls down into a random field. Does she have food poisoning? Irritable bowel syndrome? Again, I can only conclude she’s in terrible stomach pain. Then some vampire walks out of the woods and they have a conversation. I don’t know what the conversation is about because I’m still trying to figure out what emotion she had been conveying at the beginning of the scene. Then werewolves leap out of the forest as if to attack the vampire (he had red eyes, so that’s how I know he’s a vampire). Bella seems surprised there are large wolves. I learn later on that this is the movie she learns about werewolves. Still, there are no context clues to help me figure out why she had been writhing in stomach pain. And it’s not to rag on Twilight, I promise. All of my confusion with the Twilight movies stem from the fact that I have never read the books. I’m positive there are things at play beneath the surface that everyone who read the books – and the character’s inner monologues – would understand immediately. Yes, there are bad choices being made by the actors (enabled by mistaken directors), but, at the heart, it’s a dilemma of assumption. Don’t assume your audience knows what’s going on. Let me give you another example. I’m designing an infographic for one of my clients. We’re working toward a clean, crisp design where imagery is the focus and text is minimal, but we’ve had to compromise with the amount of text that will be included. The fact is that not everyone who views this piece will understand the jargon, data, or technical undertones of the information. Some of it has to be explained to the lowest common denominator. This is where the Twilight movies fail. I’ve seen all of the Twilight movies and have the same problem in each – there seems to be something going on beneath the surface but hell if I can understand what it is. There’s little to no context provided and I think it’s because the writers and directors assume you already know. A friend of mine tells me this is what watching Harry Potter is like for her as she has never read those books. I, on the other hand, devoured the Harry Potter books several times and love the films. When you tell the story of your brand don’t EVER assume that your audience will know the back story, the underlying assumptions, or the history of where you’re coming from. As much as possible design, write, and edit to the lowest common denominator. If it helps, have someone you trust outside of your company view the draft and tell you if it makes sense to an outsider. Being in it – living and breathing your brand story every day – can make you a little bit blind to how others view you as well as your expectations regarding their level of knowledge about you. The exception I would include is that if your piece is geared toward an audience that already has inside knowledge to your brand or industry. It’s a fine balance between developing a story for the lowest common denominator while also avoiding treating your audience like idiots. Knowing your audience and understanding them goes hand in hand with knowing the goals of your project and how your design and production will meet them.